Face painting is a popular activity at children's parties--and "Star Wars" characters are very popular face paint designs, especially characters from the new trilogy. Two creative designs are Queen Amidala and Darth Maul, which can be painted on girls and boys respectively. With only a little practice you can create these characters quickly and be the hero of the party. Print out a picture or photo of Queen Amidala to see what the original character looks like. When recreating an established look, it is always best to have an actual image in front of you. Paint the entire face white. Paint two red circles on the cheeks. Paint the upper lip red, as well as a downward stripe in the middle of the lower lip. Wash the white paint out of the eyebrows with a Q-tip to darken them. 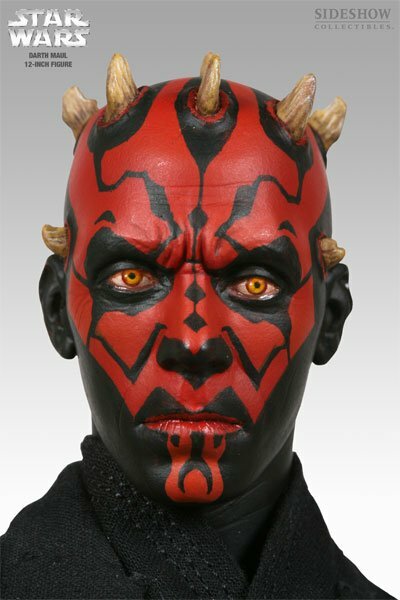 Print out a picture or photo of Darth Maul to see the original image of the character. It is a more complicated design, but becomes much easier when done one step at a time. Paint the entire face red. Switch to black and paint a line down the centre of the nose, with its associated triangles and diamonds, using a small, flat brush to get sharp lines. Paint the nose and lines under the lower lip. Paint the lower jaw and upper lip. Paint the basic eye socket shape. Paint the lines extending from the top and bottom of the eye sockets. Don't try to recreate these designs from memory; always work with an image of the character in front of you. Wash your brushes in between kids to prevent the spread of diseases such as pinkeye. Black and red face paint may stain the skin slightly.